Comments to Prof. David F. Boyd at the Louisiana State Seminary (24 December 1860); quoted in The Civil War: A Narrative (1986) by Shelby Foote, p. 58. Upon a rounded crossroads, six maidens dance. Three of flesh and three of silver. but held in the embrace of a golden Polyphemus. Ireland of the drought has gone. After an extended spell of hot, dry weather the rain returned to the Emerald Isle with a bang. Not soft, gentle Irish rain, but instant heavy tropical torrential downpour. Sere brown grass and cracked dry ground could not absorb the deluge, so flash floods ensued. Gone as quickly as they arrived and we are left with that muggy, sultry fug that follows heavy rain on hot ground. I am loving this because I get to use adjectives that Irish people only employ in foreign lands. This summer the vocabulary of Ireland is turgid with climatic superlatives. Gone are the gentle, suggestive watercolour words that usually characterise our weather talk. Instead we use emphatic, direct descriptors that fly in your face like the beggars in the Jemma el-Fnaa in Marrakesh. Primary colour words, like the poker players in “A Streetcar Named Desire”. Loud, strong words, with corners and consonants, that shout ‘hot’ and ‘bright’ across the street instead of the usual lithe, graceful, vowly creatures that whisper gently into your ear of ‘mist’ and ‘drizzle’. So I have just now learned that language too is determined by the weather. Who knew? carrying, like torches, their useless shoes? I came across the Margaret Atwood poem below, a really powerful piece of work, which talks of first principles. This blog, this Mindship is a ship of the mind, but I seem to have strayed a little from the sea. So today is about ships. A ship can be many things. A vessel such as a longship, a warship, lightship or a flagship. It can be airborne if an airship, or off planet if it is a starship or a spaceship. When you are in a ship it could be a position, such as midship, or a physical place such as a township, and even the ship of state. It could be a position, a station in life, or a job, as with a midshipman, a deanship, lordship, ladyship, kingship, even Godship, which would be a lot better than hardship. It can be a relationship, a kinship, a wardship, twinship, ownership. 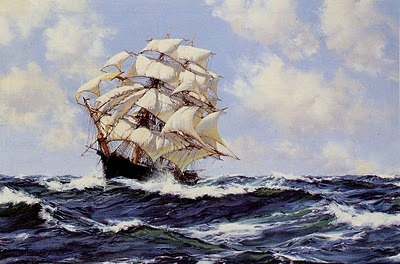 A ship can be a movement when you tranship. And a different type of movement when you worship. Worship of another might be a courtship. So all in all a ship is a useful thing to have. So versatile. An even cooler version, where you can randomise the look of the tag cloud. I got this one at http://www.wordle.net/create and it is really easy to use. Just paste in the web address you want to measure and click! I used snagit to cut the image and save it as a picture locally before pasting it in here. Today is the anniversary of the storming of the Bastille in 1798, the seminal action of the French Revolution. The impact of that revolution continues to be felt today. 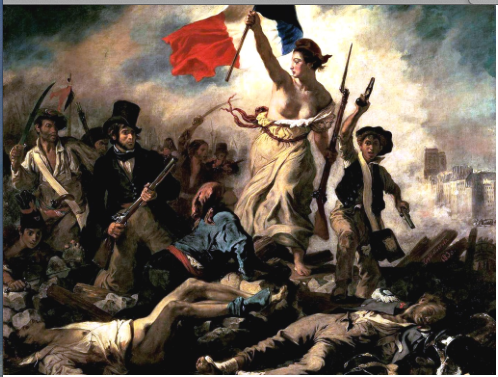 The French Revolution was an event that marked a watershed in world politics. Prior to the revolution the affairs of the world were dictated by three broad conditions. 1. God ruled, and understanding of affairs came from an understanding of the will of God. 2. In the Catholic nations the will of God was interpreted by the Pope. A strong papal representation was present in all the Catholic courts of Europe. 3. Monarchs took their authority from God, and ruled with divine right. Now I know that the British out there are saying “wait a minute, we lobbed off Charlies head and did away with divine right way back in 1649. Agreed, but you also restored the monarchy albeit in a far more controlled manner. The rest of Europe was still lagging a long way behind. After the French revolution the affairs of the world were dictated by a different set of conditions. 1. The scientific method became fundamental to human endeavour. Rational proof replaced fervent belief as the basis for understanding. 2. Since religion is founded on belief and not on rational proof, the power of the church waned considerably in the affairs of men. 3. The monarchy as a method for rule lost credibility with the passing years. People realised that it was better to be ruled by logic and merit than by divinity and birth. To avoid traffic jams of pilgrims entering and leaving Rome, Popes advised that pilgrims walk on the left side of the road. The French in the revolution rejected the pope by instructing their troops to march on the right. This is why some countries now drive on the right and others drive on the left. The evolution of the European Union today owes its origin to the visions of Napoleon Bonaparte. It was he who had the vision of a continental system with a single set of weights and measures and a single currency. It took centuries for the changes wrought by the French Revolution to work their way through society. The vision of a European Union was eventually realised only after the devastation of two world wars. Bastille day 1916 was around the mid-point of the Somme Offensive. In 1944 Bastille day was in the middle of the Battle of the Hedgerows, or the Battle for St Lo in Normandy, part of the Normandy invasion. In 1998 on Bastille day my daughter was born and the Tour de France made its first and only visit to Ireland. We as a society need to protect the values of the French Revolution. We need to defend reason and logic over misinformation, propaganda and blind faith. Too many good people died to give us rational democracy for us to give it away. Protect your rights, protect your democracy, inform yourself, and for the sake of logic and reason, please exercise your vote! Last year it all seemed so positive. The people of Egypt rose up as one and demanded democratic rights. The army found itself in an untenable position and ceded control. Elections were held. The right wing did not like the result. They gave Morsi one year as president, and now he has been deposed and arrested. Where have we seen this before? Spain in the 1930’s is a good example. A stagnant traditionalist and impoverished state. The people demand democracy. The vested interests must concede to elections. They don’t like the result. In steps the army. Civil war. Same thing in Chile with Allende. It has happened in numerous African states. Well, the problem is that democracy is a very imperfect solution. Good solutions tend to be ambiguous, slow, evolutionary. Democracy works well when you have already had democracy for a long time. The problem with Egypt today and Spain and Chile in the past is that they tried to use democracy to solve a state of national crisis. When you have a national crisis what you need is simple, fast solutions delivered by strong, unified and aligned interests. You want a demagogue, a benevolent dictator. You want a Nasser (before he lost the 6 day war). You want Mussolini (before people learned he was stupid). You want Hitler (up until 1940 when his success turned him into a megalomaniac). Arabic nations in particular seem to venerate autocracy. They seem to see the world the way Europe did back when Kings had the divine right to rule. Power flows from Allah to the Prophet and down to the Leader. In Europe we are astounded by the strength of trust and loyalty generated by people such as Gaddafi, Nasser, Saddam Hussein, Bashr Al Assad. I have come across a theory that the difference in nature between oriental and occidental rule is founded in the difference in the land between Persia and Greece. In Persia the lands are broad and relatively easy to traverse. Tribes can migrate with relative ease. Peoples moved freely westwards from the Asian steppes, northwards from Arabia and southwards from the Russian steppes. To defend your lands from intruders you needed a strong centralist authority which could depend upon the unity and support of the people. As a result the first great bronze age civilizations rose in Mesopotamia. Sumer, Babylon, Assyria, Persia, the Hittites etc. By contrast Greece is a land of rocky valleys and islands. Each valley and each island is a land onto itself, with its own lord, its own army, its own economy. It is very difficult for invaders to move across Greece. Passes are few and narrow, and the locals use them effectively for ambush. As a result Greece developed into a plethora of fiercely independent states. Different states experimented with different forms of government. They had single kings as in Macedonia, dual kings as in Sparta. There were tyrants, ruling councils, democracies, republics, oligarchies and theocracies. Through trial and error some of these systems were found to be better than others, and they evolved into the modern federal style of republic that is most common today. We incorrectly call it democracy. When Europe and America went through the throes of religious wars, the dissolution of the Roman Empire, the rise of feudalism, the emergence of the nation state, the rise of free thinking, the age of revolution and the First World War, the Arabic world was blessed with the stable and benevolent rule of the Ottomans. They had the only ruler in history to earn the epithet “Magnificent” and Suleiman truly was magnificent. Under his rule the Turks, Arabs, Greeks, Balkan peoples and Persians had a legal system far surpassing anything in Europe for centuries. They were clean, well fed and secure. To a Turk in the 1550’s Europe seemed a dirty and dangerous place. By the 1900’s it did not seem a whole lot better. Loyalty to the Sublime Porte seemed far superior to the disunity of English and French parliaments. It is really only since the end of the First World War that the West has prospered and the Middle East has reeled from crisis to crisis. And why has the Middle East failed? Well, because the Western Nations dismantled the central control of the Ottomans. We broke up their Empire, divided out the lands and handed them out to western flunkeys. Eventually the people of those lands tire of the western approved rulers and throw them out. The people who lead the throwing out tend to be strong characters with good support either from the military or from tribal structures. The nations of the Middle East have no history of success with democratic government. When they look back into history they equate stability, peace and wealth with unity, loyalty and autocracy. They do not have the western appetite for deontology and individualism at the expense of the state. They value utilitarianism and teleological sacrifice of the individual’s desires to the common good. Is it any wonder that the Arab spring has stalled? It will take a number of evolutions and revolutions before these nations “get” democracy. The West must be patient.